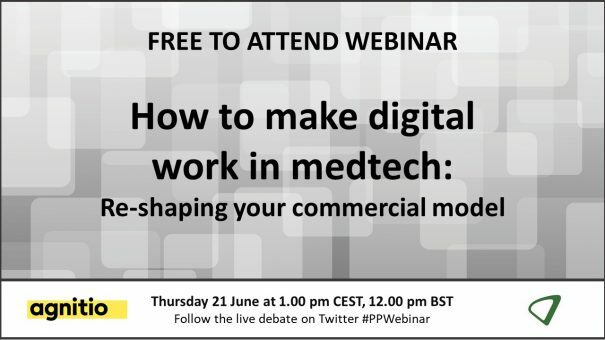 In this webinar we discussed key digital lessons for medtech from other healthcare sectors, steps to take for a successful digital transformation and how to ensure ROI from digital technology. The live webinar took place on Thursday 21 June at 1.00 pm CEST/12.00 pm BST. To watch the recorded version at a time and place that suits you please click on the button below. Markus is a globally experienced Market Access, Health Policy, Value-based Healthcare and Digitalization professional. He spent more than 20 years in the healthcare industry with increasing responsibilities in commercial, eBusiness, process excellence and non-commercial roles. He is used to leading large cross-functional teams in those areas. In addition he has been on the board of MedTech Europe for the last 2.5 years, for a European patient organization (EPPOSI) and is still a member of the board of the SVDI (Swiss Diagnostic Association). He is always thinking about how patients can benefit from value-add industry solutions and more recently how big data and digitalization can be converted into profitable business models for the industry. I have worked in commercial medical devices for over 16 years. Developing from a greenhorn sales representative for trauma and orthopaedics with Stryker in and around Yorkshire, to a business leader responsible for the $300M commercial operations of the business at Smith & Nephew UK& I. Now, having left the corporate world I am working on the commercialisation, market access and business development of start-up and early stage digital health tech companies. Jerome has extensive expertise in digital marketing and the medtech industry and leads the development and execution of a digital strategy for transcatheter heart valve (THV) therapy development in his role at Edwards. Jerome has over 10 years of experience in digital marketing, strategic and tactical planning and has previously worked for Beckman Coulter, Shire and Essilor. Lars U. Diemer leads an ambitious global team working to connect, inform and empower healthcare stakeholders. He has served in numerous international roles in global technology companies prior to joining Agnitio. Dominic Tyer is a trained journalist and editor with 19 years of pharmaceutical and healthcare publishing experience. He serves as a Contributing Editor at pharmaphorum media, which facilitates productive engagement for pharma, bringing healthcare together to drive medical innovation. He is also Creative Director at the company’s specialist healthcare content consultancy, pharmaphorum connect.